One of the great benefits of being a laser dentist is the ability to see the progress of dentistry in recent years. 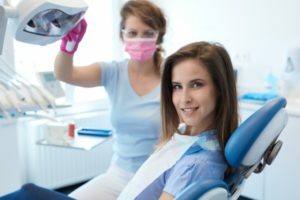 It is true that many people suffer from dental anxiety in part due to the different procedures that are necessary in order to keep the teeth in the best possible oral health. Patients may dread treatments like root canal therapy due to the stigma one associates with them. Fortunately, laser dentistry can break that stigma. Today, thanks in part to laser dentistry, treatments like root canal therapy are relatively pain-free. It is a much more pleasant experience with laser dentistry. In fact, because of the success of laser dentistry, the laser is now in a variety of regular treatment and maintenance plans. For example, we now use laser dentistry on a regular basis for tooth decay removal. The laser can remove the decay from the tooth and also help prepare the tooth for a filling. The dental laser eliminates the need for the use of a drill, effectively removing the decay. We can then proceed directly to the filling because the laser simultaneously prepares the tooth. There are also significant advances is in the area of gum treatment due to dental lasers. If a patient finds that their gums are receding from the teeth, leaving a toothy smile and the possibility of exposing the root, laser technology can reshape the gum tissue. This treatment will give the patient a more attractive smile and healthier teeth. A laser dentist never has to use a scalpel, because the precision-guided laser can do all of the work of shaping and sculpting the gums. There is an additional benefit, in that the laser will also kill any underlying decay so that once the gum treatment is complete the chances of the gum disease reoccurring are greatly diminished. Depending on the type of treatment necessary, we can adjust the power and magnification of the laser to perform multiple tasks. A dental laser can gently cut to the soft tissue, for example in gum sculpting, but can also be used to cut through the enamel in order to remove decay and prepare a tooth for a filling. This versatility makes the laser a valuable tool during dental treatments. When working with a laser dentist, patients find that the pain they experience both before and after a procedure is less than what they feel during traditional procedures. They find that their recovery times are also shortened. Additionally, patients have the benefit of lessened anxiety, reduced bleeding and swelling during the procedure, and the benefit of more natural enamel being preserved thanks to the use of laser technology. Gently and effectively clear away the bacteria causing gum disease with laser energy. A laser fiber the width of three human hairs just might be the magic wand as it targets disease but leaves healthy tissue intact. An FDA-cleared laser treatment called the LANAP protocol offers a less painful, more successful treatment alternative to conventional surgery. LANAP=LAR is the only scientifically, research-proven methodology that results in true periodontal regeneration, new bone growth and gum tissue reattachment. LANAP and LAR are accomplished with the PerioLase MVP-7. It is a free-running, variable pulsed Nd:YAG laser. The 7 variable pulse durations can be thought of as “different lasers” in one device as they have discrete and discriminating tissue interactions. The LANAP=LAR treatment is one of the most successful protocols in treating gum disease since it can target the source of the inflammation without hurting or remove any healthy gum tissue, slow or stop attachment loss, decrease pocket depth and allow the body to recover from the chronic infection without the need for scalpel or sutures. For more laser dentistry information or to schedule an appointment with Abbadent Family & Cosmetic Dentistry, request an appointment in our Dubuque dental office here: https://www.abbadent.com. Or call us at (563) 259-5181.